Welcome to our blog hop! We are celebrating our First Anniversary with a Fiskafriend Blog Hop. You do not have to be a Fiskafriend to visit and comment on our bloggers' posts. This hop is open to everyone! International visitors included! The theme of the hop is Anything Goes, so be prepared to find a variety of creative projects and ideas. I am having my own giveaway too! Instructions to enter my separate giveaway are at the bottom of this post. 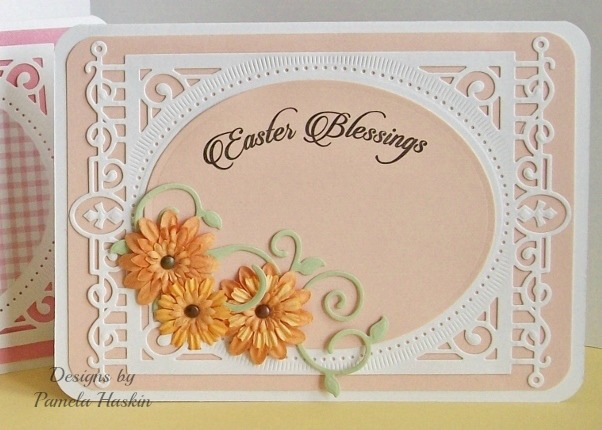 I have Easter cards to share with you on my hop stop. I've been playing around lately with the idea of what impact color and simple patterns can have in card design. I used a fairly bright pink on my first card. The gingham gives it a sort of country look, even with the fancy, white, die-cut overlay. I used the exact same design on my second card changing only the color and using a solid instead of a printed, oval layer. The second card is certainly more elegant than the first. I had a heck of a time photographing this second card. Something about the flowers is reading wrong through my camera. I'm sharing it here anyway, so you can at least get a better idea of what I'm talking about. The flowers in 'real life' are a much better match with this light peach background. >>>DESIGNER TIP<<< To get my heat-embossed sentiment to match the curve of my oval panel, I curved the clear stamp as I placed it on an acrylic block. Kind of gives an extra life to a lot of my stamps. I want to show you the inside of my cards as well. I often don't put as much effort on the inside of the card, but I'm changing that. I like bringing a little something from the front to the inside - color and theme in this instance. I wish I had thought to put a piece of the die-cut vine on the inside to peak out from under the sentiment tag. Too late, the cards are already in the mail headed to their recipients. Now, for my own giveaway. I have an e-book copy of my latest children's book, "Max, the Boy Raindrop" in which I created all the illustrations using only paper/cardstock and scrapbooking tools. I will also include a fun border punch from EK Success to send to one of my followers (US residents only). Join my blog and your name will go in the drawing. Let me know in your comment that you joined. If you are already a member of my blog, tell me so and your name will go in as well. I will draw a name for my personal giveaway on Wednesday, April 1st. Check back in to see if you are the winner. You'll have two weeks to contact me with mailing info. Pamela, these are beautiful. I'm always amazed about how something as simple as color or pattern can change the whole outlook of a card. Well done! Your creativity is awesome. The cards are simply beautiful. Thank you for participating in the blog hop.Hooray for the Fiskateers! Your cards are amazing, inside and out! I hate when that happens and I can't get the color in the picture to match what it looks like in real life. Funny thing is mine always look like I'm color blind and the card is awful but yours (although you may not like it) still looks wonderful. I really like that! All it does is make the flowers stand out, draws the eye to them. At least yours isn't a clashing nightmare. You did a fantastic job. These two cards are so pretty! I love the colors you used and the tip about curving your sentiment stamps! I have a hard time taking photos of my cards too! Thanks for sharing! beautiful card and color combos! joined with the blue tab. thanks for sharing and for being part of the blog hop! Hi Pam! I always love your cards. The intricacy of the die cuts is just amazing Thanks for sharing. Love your comparison of the background colors, and your thoughts for the insides. I really would love to read your book "A Deliberate Life" Signed up for your emails. Thanks for sharing! Your cards are absolutely gorgeous! I love the soft colors! I am following you via bloglovin' and google! Looking forward to seeing more of your beautiful creations! Your ebook sounds interesting and I would love to read it!! Thanks for the chance to! beautiful cards! Love the flowers and the bible verse! Very touching for Easter. New follower! p.s. please don't enter me in your giveaway, I already have a hard copy of your fabulous book! how beautiful is this card? I love it very nice. I need to make some Easter cards-thank you for such beautiful inspiration. I can follow by e-mail, but I'm totally confused and irritated by Bloglovin. Pamela, I love these cards. I especially enjoyed seeing how the same pattern can be used to create a totally different look. Very cool. Your style is exquisite. Never over or underdone. Always just right. I have been following you for some time and I have many of your creations. You are such a talent. Not only as an artist but as an author as well. Beautiful cards! I often like to make more than one card using the same design and different colors. Great job! Such a pretty card! I love the die cutting! Elegant creation. Those blooms are top notch. Loved it a lot. I am so glad to be your new follower. 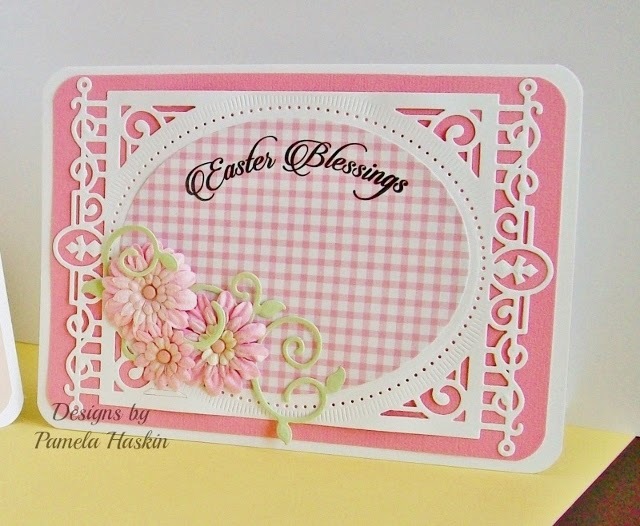 Your cards ALWAYS DELIGHT me Pamela, LOVE your STYLE, pretty colour combos and designs!!! beautiful cards Pam. Love how you did the inside as well. I need to pay more attention to that side of cards as well. Gorgeous cards! Love the delicate work to the die cuts! Michelle #7586 PS:fellow blogger from Canada don't include me in your prize draw! Already following you! Beautiful cards! I hear your frustration with photographing certain things- it's so annoying when you simply can't get a photo to match reality! I think that card matches beautifully though. Both of your cards are beautiful and elegant. The pink w/gingham makes me think of an old 2 story farmhouse with gingerbread trim along the porch and roof gables and a glimpse of the gingham tablecloth thru the kitchen window. You're an inspiration! Thank you for sharing. Like how the inside of the card is fancy too. Pamela, such a GORGEOUS card!!! Thanks for sharing with us ! Your cards are both beautiful! Thank you for sharing your stamp tip. I am not much of a stamper, so I don't really think outside the lines in that department. I think the next time I work with stamps, I will try your suggestion. 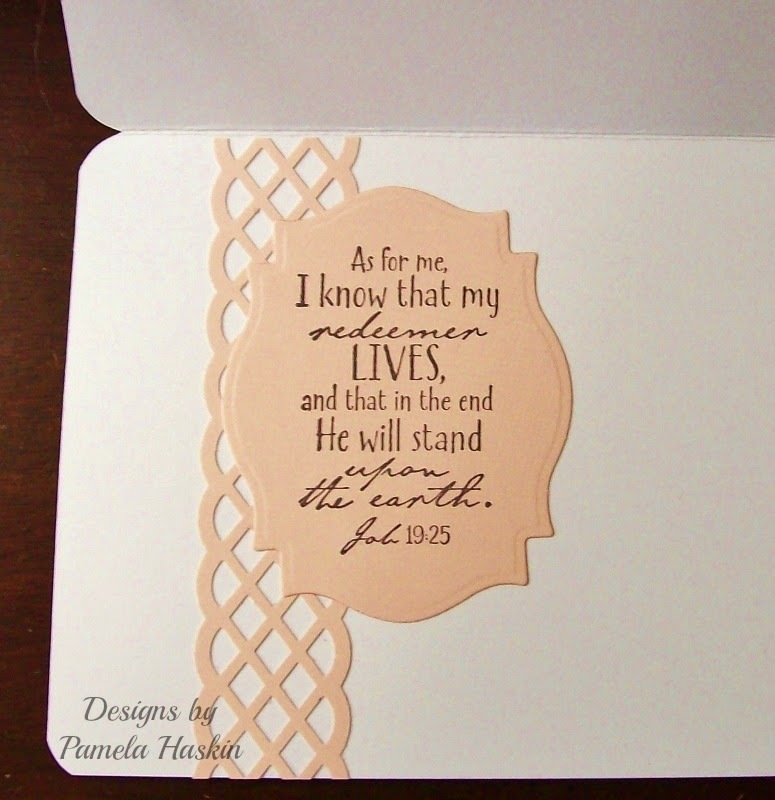 I subscribed, such beautiful cards Pamela! what beautiful, delicate cards you have shared with us Fiskafriend...thank you! Pretty ~~ P R E T T Y ~~ PRETTY Cards!! Love the tip, do it myself. It is so awesome how the gingham makes the card look so different, LOVE them BOTH.